P03 is the microfocus small- and wide-angle x-ray scattering beamline (MiNaXS) at PETRA III. This beamline exploits the excellent photon beam properties of the low emittance source PETRA III to provide micro- and nanofocused beams with ultra-high intensity and resolution in real and reciprocal space. 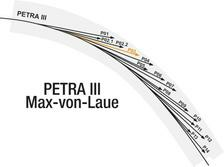 P03 is the microfocus small- and wide-angle X-ray scattering beamline μSAXS/WAXS at PETRA III. 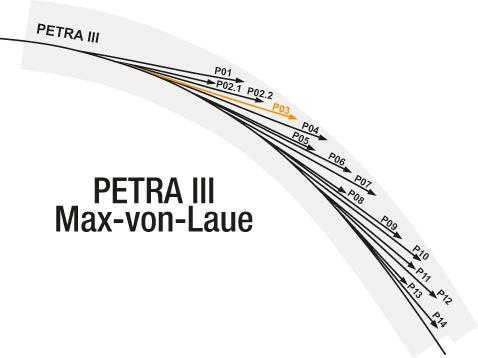 This beamline exploits the excellent photon beam properties of the low emittance source PETRA III to provide micro- and nanofocused beams with ultra-high intensity and resolution in real and reciprocal space. The MiNaXS beamline exploits one of a high-β canted 2 m undulator pairs. The energy range of the beamline is 9 – 23 keV. In combination with Si(111) crystals, this demands a very high stability and precise positioning. To suppress higher harmonics, a planar double-mirror with low incidence angle compatible with the large energy range of the beamline is used. Among the novel methods that exploit perfectly the most-brilliant beam, are μGISAXS [S.V. Roth et al., Appl. Phys. Lett. 88, 021910 (2006)] and μSAXS tomography [C. Schroer et al., Appl. Phys. Lett. 88 (2006) 164102], as well as their expansion to nanosized beams [S. V. Roth et al., Appl. Phys. Lett. 91, 091915 (2007)]. Optics for nanofocusing include KB-mirror, waveguides, and compound refractive lenses. The beam dimensions of the microfocus end station (hutch EH1) are 42 x 20 μm2 and 22 x 13 μm2, which corresponds perfectly with the design values. In 2012, an even smaller microfocus (beam size 7 x 4 μm2) was brought into operation. Additionally, a 1:1 imaging layout for combining USAXS (Ultra Small-Angle X-ray Scattering) with a moderately microfocused beam can be used. A variety of sample environments is offered at the microfocus end station, ranging from imaging ellipsometry to fluidics, spray deposition [Topical Review: S.V. Roth, J. Phys. : Condens. Matter 28, 403003 (2016)] and sputter deposition. The Nanofocus Endstation (hutch EH2), constructed within a BMBF-funded project by Kiel University (Prof. Martin Müller), is now operated by Helmholtz-Zentrum Geesthacht in cooperation with Kiel University and DESY. The minimum beam size is currently 250 nm by 350 nm and a long focal distance optics is used to provide a clear working distance of up to 8 cm. 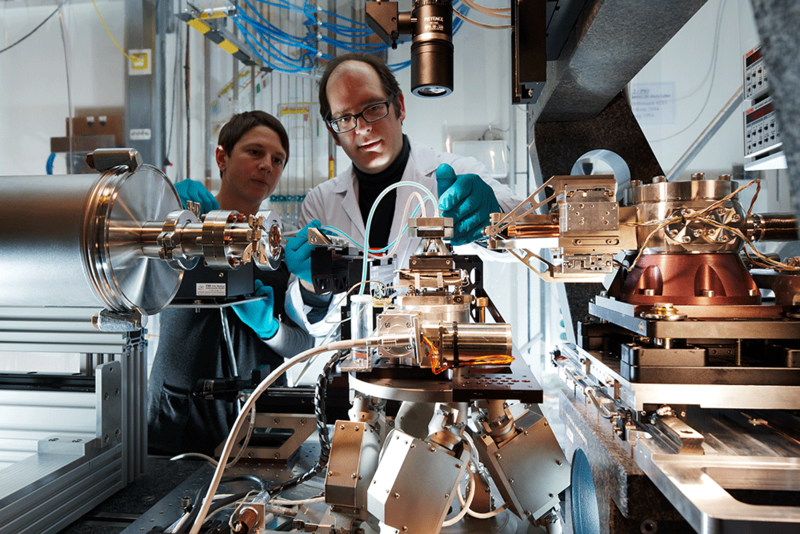 The experimental techniques at the Nanofocus Endstation have a strong focus on materials science and the long working distance is an excellent setting for extended in situ sample environments (such as high pressure, nanoindentation, tension, electric / magnetic fields). Data analysis coping with the high data rates is crucial. The software package DPDAK - jointly developed and operated by DESY and MPI Golm - allows for online analysis of the GISAXS/SAXS/GIWAXS/WAXS data.